It's Day 2 of our week-long collaboration with The Cut Shoppe, an Etsy store which sells a variety of cut files (in SVG/PNG format) for use with electronic die cut machines. 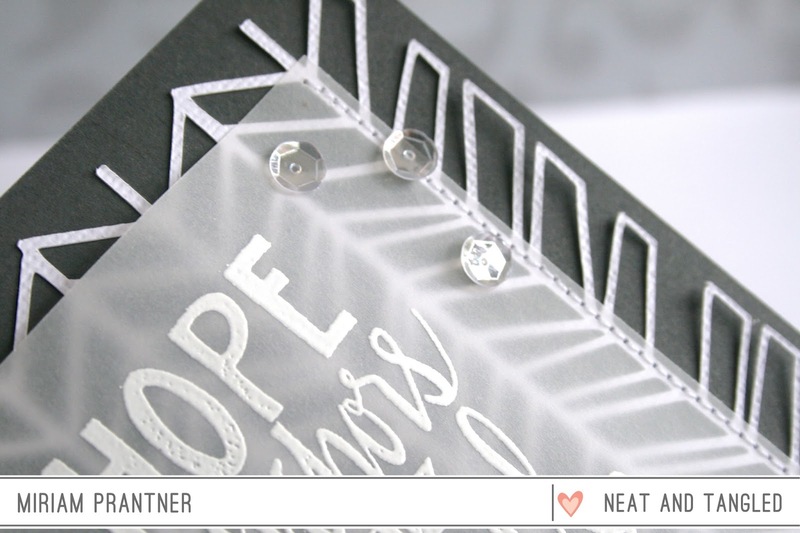 Each day this week we'll be featuring projects using The Cut Shoppe's files, and The Cut Shoppe team will be featuring projects using Neat & Tangled stamps on their blog. Be sure to stop by each blog as there are giveaways! The Cut Shoppe will be selecting one lucky commenter to win a $25 credit at the Neat & Tangled shop, and we'll be selecting one commenter from our blog to win a $20 credit for The Cut Shoppe. In addition, The Cut Shoppe is offering everyone a special discount this week. Use code TCSNT30 for 30% off at the Cut Shoppe April 13-19. Hey everyone! Miriam here to share today. I must confess that I have sorely neglected my Silhouette the last several months, so I was excited to dust it off and pull it out to create some cards. We were able to select several files to use for this week's collaboration. I really love background cut files, and one of the great things about the Cut Shoppe is that you get the backgrounds in both 12" x 12" and 8 1/2" x 11" formats. The 8 1/2" x 11" is perfect to create card backgrounds. I've got carried away and ended up with three projects to share today. This first card features the Geometric Graffiti background. I cut the background, and then leaving it intact on the cutting mat stamped the Origami Map image. I then used ink blenders to apply a rainbow of colors to the design. The map image was then stamped onto a card base. Then I started removing the die cut triangles and adhering them to the card base by lining up the stamped images. 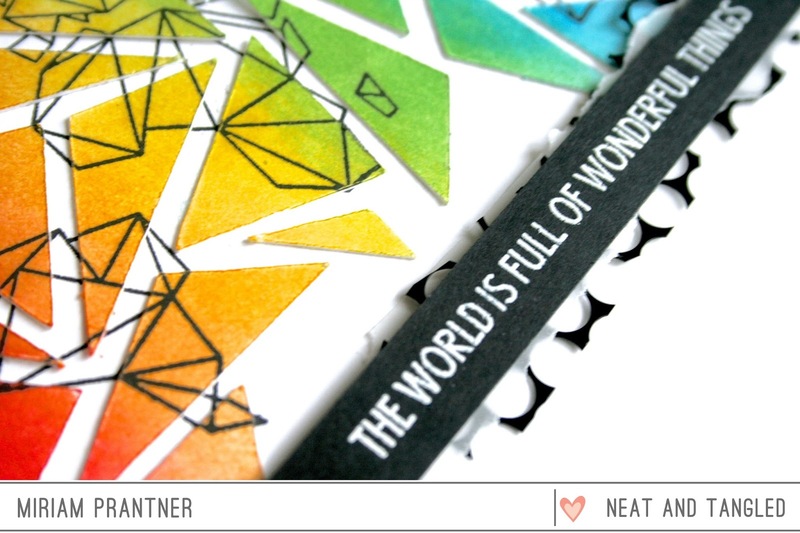 The sentiment was embossed on a black strip of cardstock and popped up over some bits of vellum and punchinella. My second card uses the Hip2BSquare background. Again I used the 8 1/2" x 11" version shrinking it down to A2 size. Once it was cut, I removed the cut from the sheet leaving the negative pieces intact. I used my detail scissors to snip out a frame/opening within the die cut. I placed the altered die cut over my cardstock panel and lightly traced around the opening with a pencil. Then I removed the die cut piece and stamped around the opening with the large solid flower image from Paper Cut Flowers using several colors of ink. I also stamped a sentiment from Paper Cut Flowers. The die cut piece was then adhered to the stamped panel. For some extra interest, I removed some of the negative cuts and colored them using the ink pads I used for the stamping and then placed them into the die cut background. My last card is very CAS. 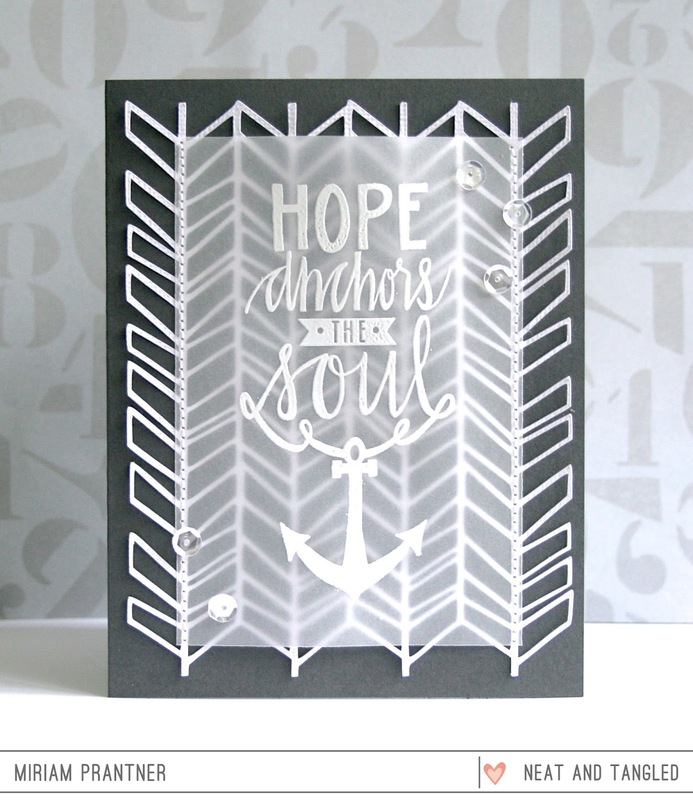 The focus is the Hope Anchors stamp and Arrows with Attitude Background die cut. I simple die cut the background and just tacked it down a bit on the card base. 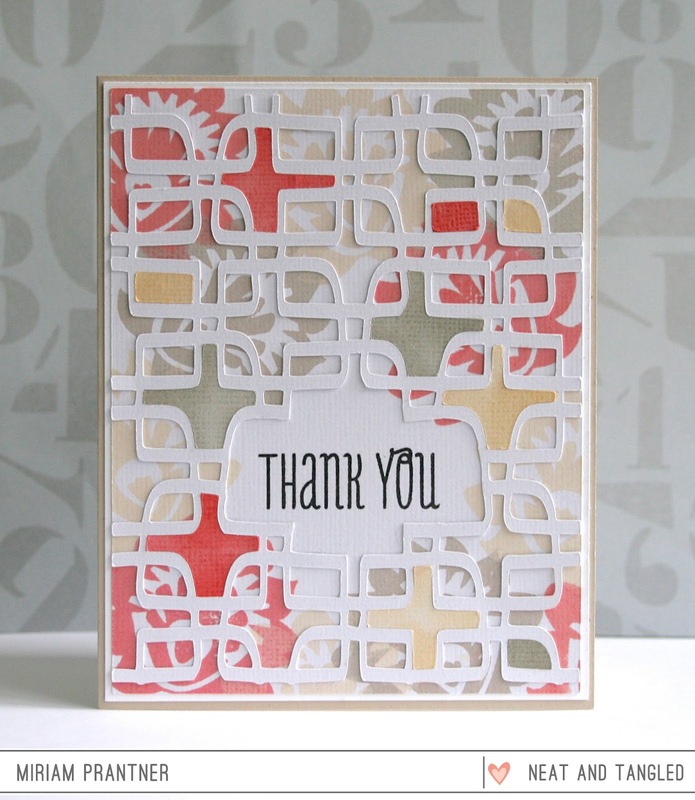 The sentiment was embossed on some vellum and the then stitched to the card base/die cut. I didn't actually use any adhesive on the vellum as I wanted it to kind of float over the die cut piece. A few Crystal Clear sequins finished it off. OK, you definitely want to head over to the Cut Shoppe blog. There are prizes to be won, all you need to do is leave comments on both blogs all week, so make sure you check in each day. Absolutely amazing cards ..love them !! Swoon - wow!! INCREDIBLE cards! That origami map card - WOW!!!! Beautiful! and looooooove that arrows background!! SUCH amazing cards! I love the deconstructed geometric. they are all great but that one caught my eye the most. thanks for sharing. Makes me think about getting the Silhouette out again and trying to use it. (I'm kind of computer-challenged). OH I LOVE THOSE BACKGROUNDS!!!! Gotta grab them :D These cards are so fabulous. This is totally amazing team up! I love them all! Those triangles and the origami map are perfect together. I just got the Hip2BSquare. Hadn't thought of using it on a card. Will now. These are fabulous! 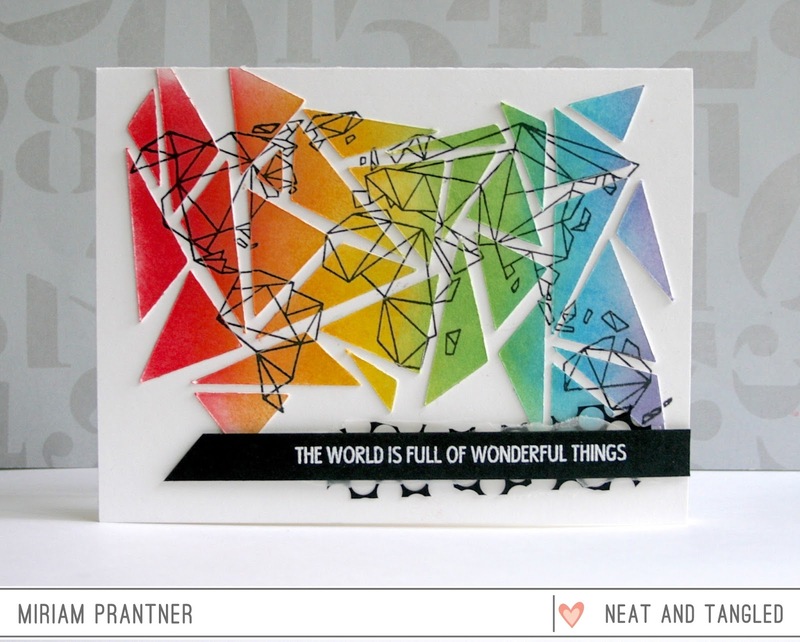 I love the rainbow look on the first one (as well as knowing how much detail went into creating it), how you stamped the background and used the die cut on the second card is wonderful and I adore the way you have the vellum "floating" above the die cut on the third card! Thanks so much for sharing! Glad you got to play with your Silhouette a bit! Three super fantastic projects Miriam!!!!! my godness this cards are just amazing!!! Oh Miriam!! You just keep getting carried away... I am blown away by your creativity! Rainbow color background with word map card is Awesome! Amazing eye, Miriam. You make me want to dust a little, my Silhouette has been lonely also. 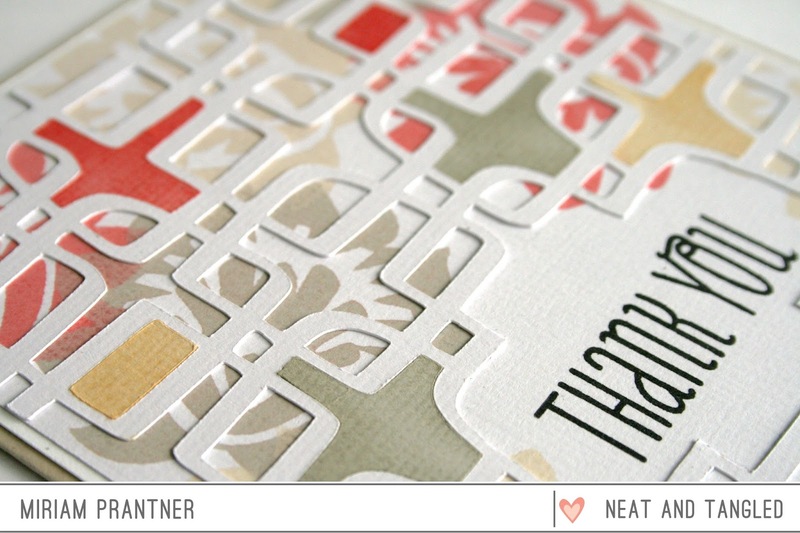 I especially love the vellum card, so classy! Oh woow - so cooL! Glad that you got carried away because each project is soooo inspiring! Beautiful work, I especially loved the hope anchors card. It was stunning with the vellum and pretty cut file behind it.